These plants were selected for their productivity, resistance, resilience, hardiness, and beauty in tough situations, like community plots, low maintenance yards, and exposed rooftops. 2017 was another warm year (hottest on record) with periodic droughts, pest and disease outbreaks, and ferocious storms with gusty winds. 2018 Mossies are tough as nails, approved for beginners, fun for experts. The categories cover ornamental, vegetable, and eclectic gardening. The selections range from the common to the obscure, but in most cases all are easy to find and just as easy to grow. 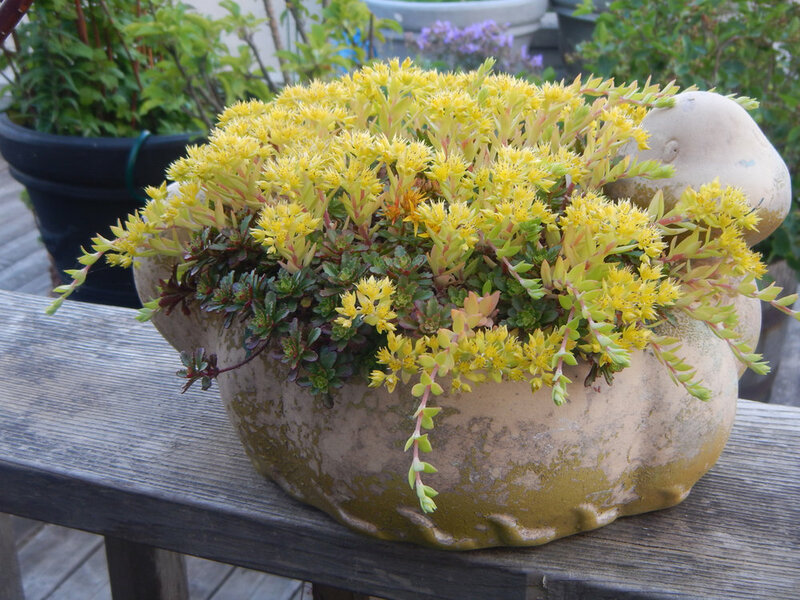 Stringy Stonecrop or Gold Moss is a vigorous, chartreuse to lemony groundcover. We’ve grown it in containers for its short stature, colorful foliage, hanging stolons, and bright yellow, nectar-filled flowers. In ground Sedum sarmentosum takes off. It forms a golden carpet in sun or shade, clay or sandy, up to and around larger plants. It’s best season is spring, but it looks neat and tidy most of the year. Woodland plants are not known for container success, especially on rooftops. However, Actaea ramosa has excelled for us since moving from the doomed Pullman Gardens to our roofdeck a few years ago. In early spring I divided it and removed some lily-of-the-valley to give it more root room. The result was beautiful dark ferny leaves in spring and summer that all but obscured the container. All that healthy burgundy foliage lead to towering, sweet scented bottle brush flowers in early fall. Fairy candles bloomed for well over a month and attracted scores of friendly pollinators. Triumphiator is a LO lily, a cross between Longiflorum and Oriental types. The Oriental parentage imparts hardiness and a perfume scent, while the Longiflorum genes add pastels and flower shape. 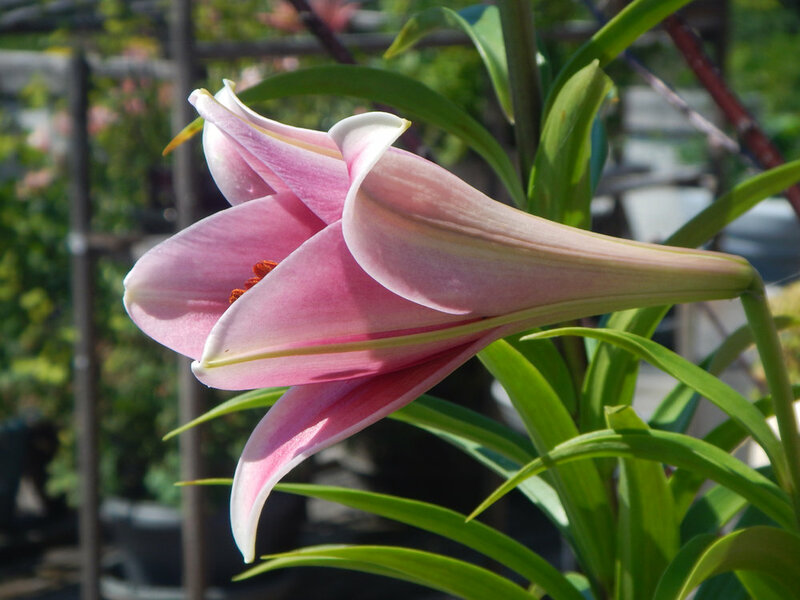 LO lilies are easy to grow in ground or container. Triumphiator holds its perfumy pink trumpets at eye-level and looks you in the face. The dark pink interior softens to ivory-white along the margins. These strong growers are perfect for bouquets. I finally bought a Dragon Arum tuber at the 2016 Chicago Flower and Garden Show after years of wanting one. It grew a little, then went dormant around July. There was no sign of life until last winter in the cold frame when a shoot emerged. By spring it was thick, tall, and obviously a flowering shoot! 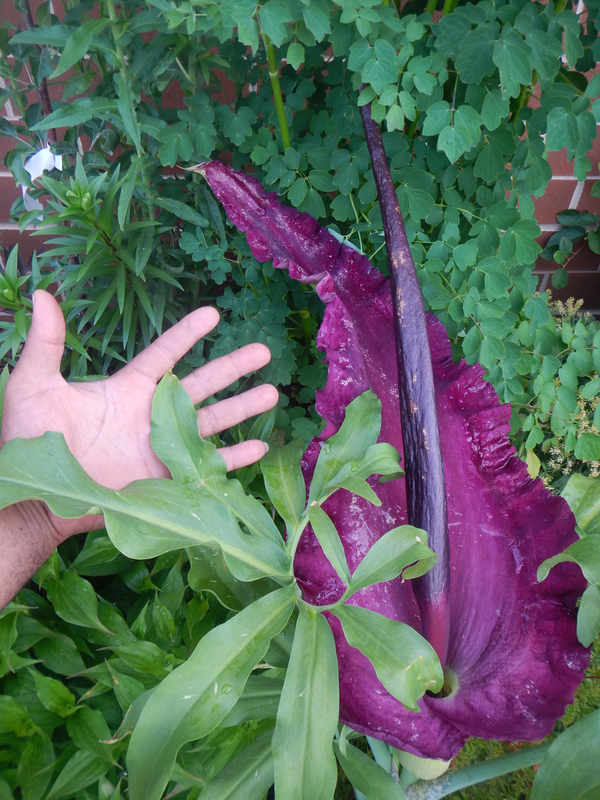 The meter long flower stalk unfurled a massive, funky, deep maroonish purple spathe and spadix. The dragon had risen! Hellebores are some of my favorite flowers. I’m in awe of the ability of these amazing plants to bloom so intricately in late winter and early spring. Some, like Helleborus niger, start in December. It needs a cold frame in my Chicago garden, but it’s worth the effort to have such an amazing companion blooming all winter. Fumeworts emerge in early spring and soon paint the garden floor in reds, pinks, purples, and lavenders. These underused bulbs (tubers) have little funnel-shaped flowers held on short spikes above ferny, chartreuse foliage. Although small, the flowers are densely packed and provide a big punch of color in mass. It disappears as quickly as it emerges, leaving little trace and making way for the summer show. George P Baker (shown above) is a quick spreading cultivar producing lots of tubers and deep pink flowers. This South American native blooms all season until hard frost. The cluster of purple flowers are held on elongated stems. Plant them behind other flowers for a bright background and eye level color. Butterflies and other friendly pollinators flock to the flowers. Although an annual in cold climates, it volunteers readily and returns to the summer garden year after year. Grandmother Ruth grew sunchokes or Jerusalem artichokes as a root vegetable along the back fence. Unfortunately despite her offerings, I never tried the gnarly pickled roots she made. Today we cook the tubers like potatoes and harvest the 8’ flower stalks for dazzling late season bouquets. 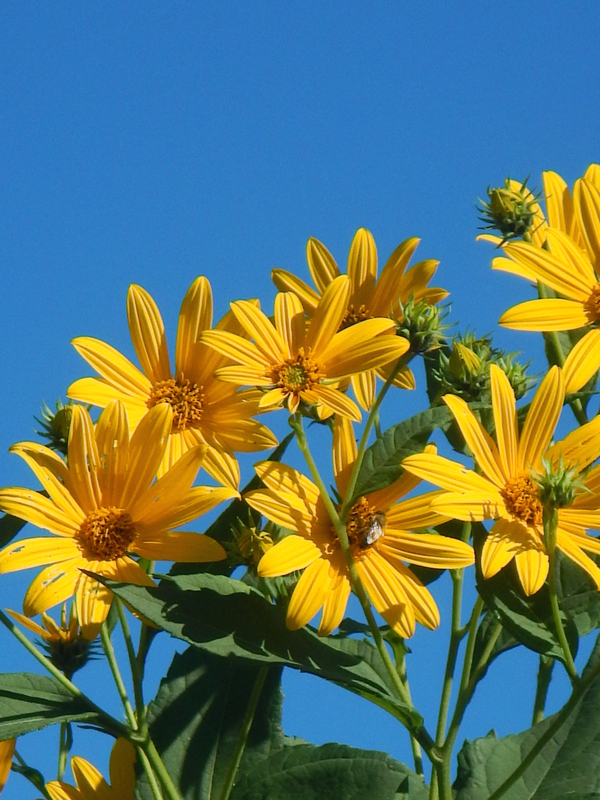 The silver-dollar-pancake sized flowers are a deep, golden yellow and held in loose clusters accented against the azure autumn sky. My favorite herb. To my wife’s chagrin, I use it on everything. 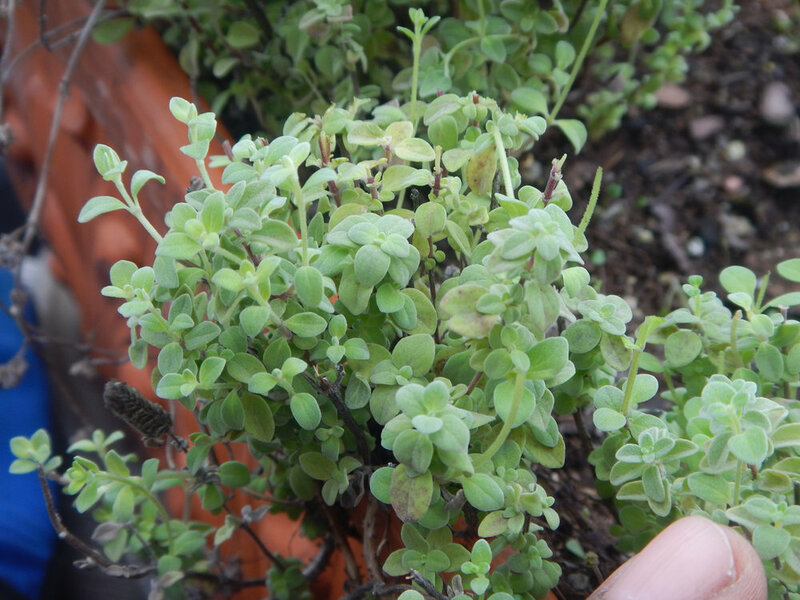 Marjoram has a mild sweet flavor compared to its more pungent siblings oregano and Za’atar. 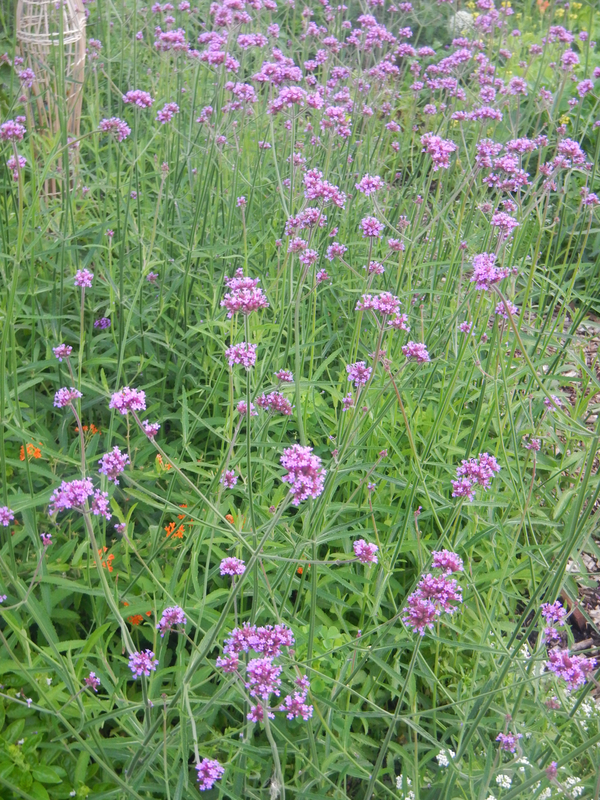 Marjoram grows well in ground or containers, and attracts beneficial insects to the garden. Harvest regularly for the best tasting leaves. Dry thoroughly. Store in glass containers. As a tender perennial, it is also much less aggressive than oregano. We grow the hardy bushes in rooftop containers and harvest the sweet fruits in midsummer with a small repeat crop in early October. Easy to grow. Hardy. Productive. Delicious in salads, pies, compotes, and lemonades. For about a decade our Chinese Fir has been a squat bush. It would grow a bit wider but not taller. Finally in 2016 after having the live oak thinned for light, it put a stem straight up. In 2017 that stem grew into a trunk, finally becoming a tree! Chinese firs look ancient because they are. The spiky branches deterred dinosaurs from snacking on them. Now I use them for back scratching. 2017 was not a good year for our tomatoes. A cool June stunted the summer crops. Even so, the Sun Golds still provided delicious garden snacks. The sweet citrusy taste helps those of us who aren’t as fond of typical tomatoes to get our phytochemicals and lycopene. In addition to the taste, Sun Gold’s ornamental deep orange fruits add ornament and interest to the garden. Everyone should eat more leafy greens, especially mustard (Brassica) family greens because they contain lots of antioxidants and vitamins. Asian mustards have lots of varieties that are best eaten raw. Many, as the name “mustard” would imply, are spicy or bitter. However, Choy Sum or Kailaan is an exception. The cultivar Hon Tsai Tai has mild, sweetish tasting leaves, stems, and flower stalks. The purple hues and bright yellow flowers make it a winner in the vegetable or flower garden. My great grandmother, Ruth aka Pundy, gave me a cutting from her sweet potato plant in 1998. We’ve grown and harvested that plant every year since. We get over 75 pounds of this superfood every year! Enough to take us from fall to summer. Some years when we have hot summers, we even get purplish, morning glory-like flowers. Pundy’s sweet taters combination of beauty, amount of produce, and nutrition can’t be beat. Any plant that grows up and adds to the dimensions of my garden is a winner. Italian clematis does that and puts on a show too. The turks-cap shaped flowers open in profusion in mid summer with sporadic blooms into autumn. The Betty Corning cultivar (Jill’s favorite) blooms profusely and is suited for patios, porches, and other small garden spaces. 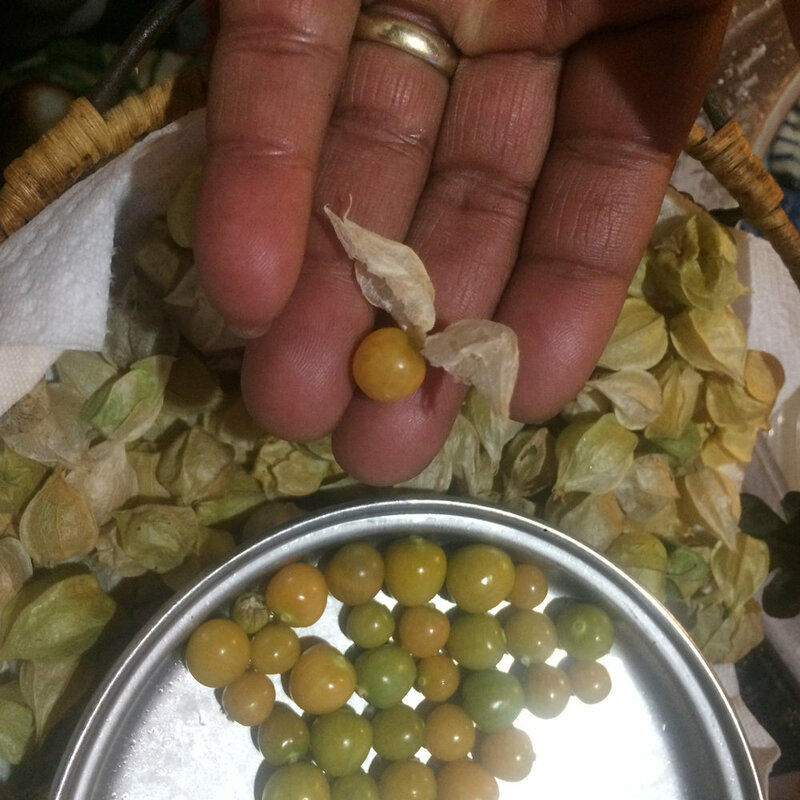 Ground cherries are underutilized in American gardens. The fruits are like little cherry tomatoes inside a husk, except they are much sweeter and not as acidic. I sowed Aunt Molly about a few years ago and have not resown since. Like tomatillos, the fruits that drop to the ground spread seeds that volunteer the next year. In 2017, I harvested more ground cherries than ever and didn’t sow a seed. All those volunteer ground cherries became tasty compotes and flavorings for roasted meat dishes. Ranked #11 among American universities. For the first time the basketball team made the NCAAs and stayed for a whole weekend. Football team finishes 10-3 with another bowl victory over the sec. And, had an eye-catching, perfumed, spring welcome to the campus. 2017 was good for Wildcats. I’m convinced that robins got their name because of all their robbing! These brash birds are the boldest thieves in the garden. Every year we have mad conflict with them because they love serviceberries as much as I do. Infuriatingly, robins will eat the berries a few days before they get sun-ripened sweet. And they will eat them all! 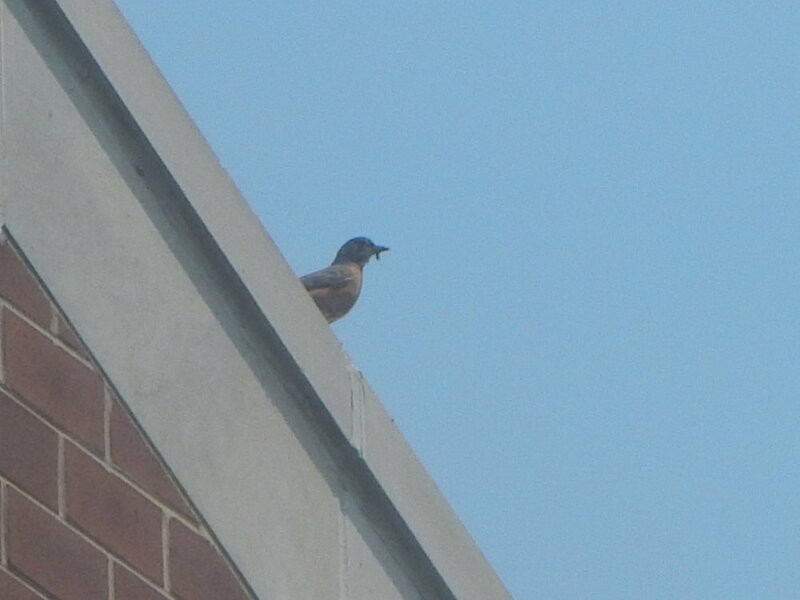 Robins don’t share. We have to cover our rooftop bushes or we would not get one berry. It’s not just that they are larcenous, its the cocky arrogance with which they commit their pilfering. They look at you with disdain and indignation, as if you were the thieving interloper. My twins scream at them and I curse them often, but they always return. They are good garden companions most of the year, but during berry season robins are the worst! The Trials of an Urban Pomologists is the title of a book I’m working on. Or at least it was until last year. Now I may just call it Don’t Grow Fruit Trees in Containers Unless You Need Some Disappointment in Your Life. Many of my favorite fruit trees, including MOSSIES winners from the past, died last year. Centennial apple, Montmorency cherry, Freedom blackberry, Bonfire peach, and American plum all died during or before bud break. In total 12 rose family fruit trees and bushes died out. They all looked healthy during winter. But as spring arrived the buds struggled to open and those that did quickly wilted. It resembled a fire blight but it didn’t occur during summer and bark didn’t blacken. Whatever it was, it affected established and newly planted trees. Bonfire peach has been a star in my garden for over ten years. Belle of Georgia peach was a brand new addition. Cold frame or exposed winter storage did not make a difference either. Neither University of Illinois scientists nor Chicago Botanic Garden experts could readily diagnose the condition. There wasn’t even a learnable lesson; it was just frustrating and sad.